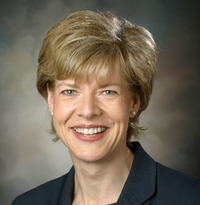 U.S. Rep. Tammy Baldwin of Madison, Wisc., a lesbian, has been named an honorary co-chair of President-elect Obama's inauguration. The announcement comes a few days after the Obama team said that Rick Warren, a Christian conservative minister who campaigned against gay marriage in California, will deliver the inaugural invocation. WASHINGTON, D.C. - Today, the 2009 Presidential Inaugural Committee announced the honorary co-chairs for the Inauguration of President-elect Barack Obama and Vice President-elect Joe Biden. In keeping with the President-elect's commitment to an inclusive and bipartisan Inauguration, the list of honorary co-chairs includes members of the President-elect and Vice President-elect's immediate families as well as prominent Americans from both sides of the aisle who have dedicated their lives to selfless service to their fellow citizens. "Vice President-elect Biden and I are grateful to these distinguished men and women for agreeing to serve as Honorary Co-Chairs for the Inauguration," said President-elect Obama. "From family members to former Presidents, each of these leaders has an unwavering commitment to bipartisan cooperation and a proud record of service to their community and our country. They exemplify the spirit of unity and shared purpose this Inauguration will reflect."